Designed by John Barr. Damsel Nymphs are a good choice in many stillwater situations, especially during June and July. Work the nymph with a slow erratic retrieve particularly around the edges of weedbeds. Use an intermediate sinking line or a floating line with long leader. John's design is a good durable choice since the wire shank of the hook is utilized as the abdomen. Keep the marabou tail a tuft of about one half the shank length and pinch-tear the tip of the marabou fibers so that the webbiness extends almost to the tips. 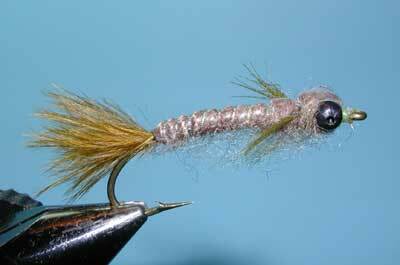 Use a bead chain type of eye to give the fly some weight and offer some jigging action.